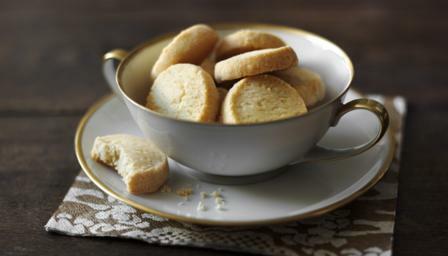 I go into auto-Parmesan-shortbread mode whenever I have friends coming for supper, as not only is it perfect with drinks, but it can be made in advance. Indeed you can make the dough, wrap it and then leave it in the fridge for up to three days before slicing an baking, although you will need to let these cheese-scented cylinders sit out on a kitchen surface just long enough to get the fridge-chill off them before slicing. Take the first half and, using your hands, roll it into a cylinder, as uniform as possible without stressing over it, about 3cm/1¼in diameter. Make sure the ends are flat, too, so that the cylinder resembles a roll of coins. Now wrap this up in a piece of cling film, twisting the cling film at the ends, like a Christmas cracker, and put the roll in the fridge, then proceed in the same way with the remaining half of the dough. Preheat the oven to 180C/375F/Gas 4 while the dough rests in the fridge for about 45 minutes, by which time you should be able to cut them into thick slices easily; aim for about 1cm, think fat pound coins or similar. Arrange on a baking sheet lined with baking parchment and put in the oven for 15-20 minutes, when they should be just beginning to turn a pale gold at the edges. Remove from the oven, then leave to cool (if you can) before eating.